Siberian hamsters are being drafted in by researchers in a drive to combat obesity in humans. Scientists at Aberdeen's Rowett Research Institute believe genes in the hamsters could control how much they eat at various times of the year. 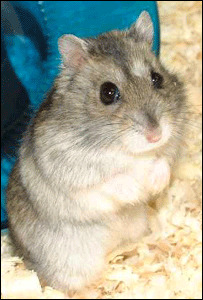 Siberian hamsters are able to adjust their weight to become fatter in the summer and leaner in the winter. Rowan Institute director Professor Peter Morgan said he hoped the work would help to tackle human obesity. The institute has been awarded £250,000 in EU funding to continue its research. The five-year project will involve 24 groups of scientists in 10 countries and has been co-ordinated by Gothenburg University in Sweden and funded under the EU Sixth Framework Programme. It is hoped the project will unravel the complex systems involved in body weight control in the hope that more effective treatments can be developed. Siberian hamsters can vary their body weight by as much as 40% according to the weather. They are able to control precisely both the amount of food they eat and how active they are. Prof Morgan said: "Part of the reason why it is so difficult for humans to lose weight, and keep it off, is that we have evolved regulatory systems to protect our energy stores. "So once we are overweight our brains exert powerful control mechanisms to keep us at that weight. "Since the underlying mechanisms of body weight control are likely to have remained in place throughout evolution, we hope that some elements of the hamsters' control systems may be still present in humans."